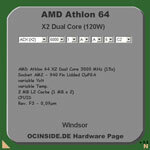 The interactive AMD Athlon 64 product ID guide for the identification of the AMD CPU description (OPN) is available in the version 3.1 and contains all current AMD processors. Simply select the description of the AMD Athlon 64 CPU over the dropdown fields and get the technical data of the processor virtually. The service is of course completely free and can be directly controlled by online Shops, forums, or web pages since the version 3. It’s sufficient to attach the OPN with ?cpu= at the end of the URL.